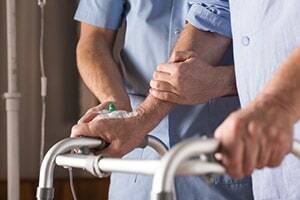 The settlement value of nursing home fall cases depends on many variables. The issues at play in every negligence case, the makeup of the municipality that makes up the jury pool, the likeability of the parties, and the like are always going to be center stage. In the settlements and verdicts below, those factors certainly played a significant role in the outcome of the lawsuit. This is why a verdict or settlement with almost identical facts will have very different outcomes. Looking at the specific settlement variables in nursing home cases, the cases with the greatest potential values are going to be the most tragic. The most classic high-value nursing home cases are when the resident now needs 24 hour individualized care as a result of the injuries, particularly if the resident is relatively young. From there, in Maryland, the next highest settlement value case is usually a wrongful death claim. Regardless of how old the victim was, most Maryland juries are going to view depriving a senior of their golden years and the loss of a parent as worth a great deal of money to the surviving family. The downside of these claims from a value perspective is the cap on non-economic damages puts a limit on the value of these cases. It is rare that there are significant economic losses in these cases because most nursing home patients are not earning income or providing household services to their family. So wrongful death nursing home cases in Maryland are largely limited to the cap. The "bottom" of the food chain of settlement value involves cases that are nonetheless tragic: serious injury cases that cause great suffering but where the victim ultimately fully recovers. Do our nursing home lawyers take cases like this? Sometimes. The "every case" factors we talked about above - venue, how compelling the victim is, etc. - usually are the driving factors is whether to pursue a claim where the victim endured great suffering but has not recovered. Below are sample verdicts and settlements in nursing home fall cases. These cases will certainly help you figure out the range of settlement values in these types of cases. Can you use this to figure out how much you will get in a settlement in a similar case? No. There are just too many variables at play. But make no mistake: nursing homes, particularly large chain nursing homes, do not want viable cases to go to trial. The overwhelming majority of meritorious nursing home cases end in an out-of-court settlement. The values of the Maryland cases are rather low and do not reflect the average value of a nursing home death fall death case in Maryland. But you have to remember that we do not post our nursing home settlements and verdicts because of the confidentiality clauses we are required to sign when we resolve these cases. So the guess here is that these cases were allowed to be reported because the settlements were so ridiculously low. 2016, Pennsylvania - Genesis Healthcare: $215,000 Settlement. A 70-year-old resident is residing at Crestview Center, part of Genesis Healthcare. While there, he suffers multiple falls leading to dislocation of his hip. This requires surgery and a prosthetic, which becomes infected and requires multiple hospitalizations. He alleges the nursing home failed to provide him with a residence that was free from fall hazards and that they failed to properly implement fall prevention measures. The defendants deny negligence but settle the claim for $215,000. 2016, Pennsylvania - Genesis Healthcare: $625,000 Settlement. An adult male is residing at Hillcrest Center, owned by Genesis Healthcare. While residing there, he develops many problems - multiple falls, pressure sores, UTI's, dehydration, and pneumonia. His estate claims that the nursing home failed to supervise an adequate amount of staff, failed to implement fall prevention measures, and failed to prevent pressure sores. The plaintiff settles with Genesis and the nursing home facility for $225,000, and the remainder of the parties for an additional $400,000. 2016, Pennsylvania - Manor Care: $350,000 Settlement. An elderly female is residing at Yardley, a Manor Care facility. While there, she suffers over 30 documented falls. These all leave her with various injuries, including a fractured hip, pelvic fractures, a sacral fracture, a chest wall fracture, and multiple subdural hematomas. These ultimately led to her death. Her Estate argues that the nursing home failed to properly implement a care plan including fall risk measures for the woman, and failed to prevent injury. The defendants denied any negligence but settled the dispute for $350,000. 2016, Pennsylvania - Genesis Healthcare: $800,000 Settlement. An 88-year-old woman resides at a nursing facility operated by Genesis Healthcare (Sanatoga Center). While there, she suffers multiple falls. These result in a femoral neck fracture requiring surgery, a subconjunctival bleed, skin tears, bruises, severe pain, and result in her untimely death. Her estate alleges that the defendants failed to keep her from falling and failed to ensure she didn't suffer from pain. The defendants deny negligence but settle the claim for $800,000. 2014, Pennsylvania - Manor Care: $110,000 Settlement. A male is residing at a ManorCare facility after spinal surgery. The staff at the nursing home conduct an assessment, and he is at high risk for skin breakdown. Additionally, the man suffers from multiple falls during his stay at the nursing home, and his estate alleges that he had to be transferred to a hospital several times since the staff at the nursing home did not ensure that he wouldn't fall from his bed. In addition to the falls, he suffered from many medical conditions while residing at the nursing home that he alleges stem from inadequate care. The nursing home claims that his injuries were due to underlying medical conditions, but settles the claim for $110,000. 2012, Pennsylvania - Golden Living Center: $220,000 Settlement. A 74-year-old male is residing at Mt. Lebanon, a Golden Living Center nursing facility. He is unable to bear weight on his legs and requires a mechanical lift every time he is transferred or moved from his bed. One day, he is asphyxiated by the side rail of his bed, which causes his death. His estate alleges that his bed alarm did not sound, his bed rails were not tightly secured, and that there was a large gap between the rail and the bed frame. The parties settle for $220,000. 2001, Maryland: $54,685 Verdict. An 81-year-old woman is in the process of being transferred to a chair by a non-party employee of her nursing home. She alleges that her medical chart made clear that she was to be moved by two people to avoid injury due to her medical condition. However, these instructions were not followed, and she fell. She subsequently dies from her injuries. The defendant argues that the woman's brittle bones made death unavoidable, but a jury awards the woman's estate $54,685. 1998, Maryland: $63,731 Verdict. A woman is being transferred from her bed in a nursing home to a chair while being changed. During this, she falls off of her bed. Her Estate claims that this breach of the duty of care led to her death, while defendants claim that her death was unrelated to the fall. A jury awards her estate $63,731. 1995, Maryland: $100,000 Settlement. A woman residing at a nursing home is taken to the restroom. However, she is left unattended and falls while she is in the bathroom. She sustains a left hip fracture, and is hospitalized for this. However, while being hospitalized, she dies from aspiration pneumonia that she contracts while she is there. She alleges that the nursing home was aware of her existing conditions such as confusion, dementia, and stroke. The parties settle before trial for $100,000. These are some of the nursing home fall lawsuits that have been filed in Maryland in 2016. The fact patterns often have many reoccurring themes. Tarleton v. Glen Burnie Health and Rehabilitation Center: A resident fall, breaking his hip. Tragically, he dies a week later. Dicus v. Glen Burnie Health and Rehabilitation Center: This is another wrongful death case involving the same defendant. A man who is a known fall risk tried to get out of his wheelchair while left unattended. The big question in this case will be whether it was reasonable to leave the man alone. Eichelberger v. Emerge: A man falls and dies after taking medications that allegedly made him an even greater fall risk. The family's nursing home lawsuit contends that an appropriate fall risk would have prevented his death. Ballard v. Aurora Senior Living of Manokin: Resident fractures her hip on the way to the bathroom. Was there a plan in place to take the resident to the bathroom every two hours? Should they have been such a policy given the resident's fall risk? Have you or a loved one suffered as the result of a mistake or omission by a nursing home? Miller & Zois can help you. You are entitled to justice and compensation for the unnecessary harm that has been done to you. Our law firm, Miller & Zois, has a long history of getting results in serious injury and death cases in Maryland, earning large verdicts and settlements. Call Miller & Zois today to speak to a medical negligence attorney who can help you, at 800-553-8082, or get a free online case review.